For those who need help envisioning a quince, here is a description from my 9-year-old son: “Quince are so annoying. 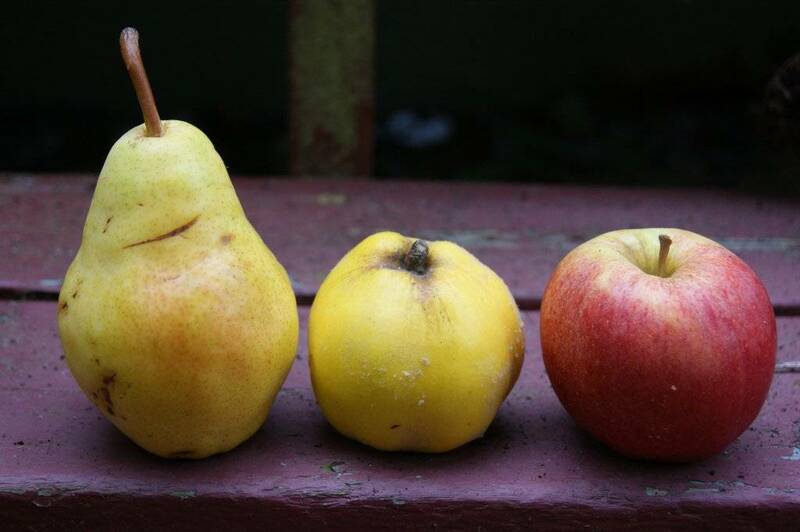 They’re like yellow, short, apple-ish pears. And why are they so fuzzy?” Ah-ha-ha *cough, cough* Wait – I admit quince are annoying. Not only are they strange-looking, fuzzy, and hard to come by, but they must be cooked before being eaten, and they are very, very hard to cut into. It’s quince season and you are about to get jazzed to use this GLORIOUS fruit! Next, quince are magical to cook with. As they cook, they slowly turn from white to rose-pink to jewel-toned burgundy by a mysterious process I call medieval magic* (and which other people may have a scientific name for). And as they cook, they fill your kitchen with their delicious perfume. 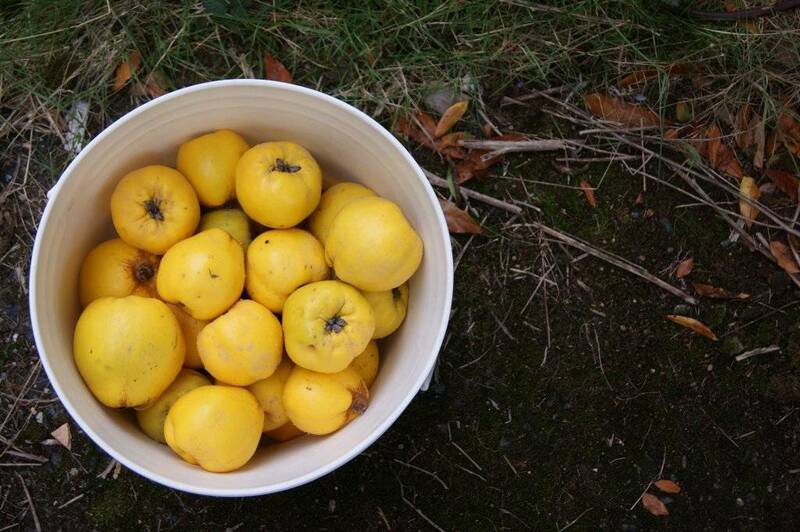 Adding to my personal kitchen joy, quince are a fruit of medieval significance. Old World literature is loaded with references to quince; recipes for quince are at least a hundred years old, most often several hundred. Preparing quince, I can imagine that I am preserving the harvest with epic peasant cooking skills, not unlike a beautiful Spanish senorita in the medieval Andalusian countryside (did I just say that out loud?). I love the medieval look and feel of quince so much that I want to make it a rule that you can only cook them while listening to a Loreena McKennitt album. Quince are easy to find in Victoria. Various farm market stands will carry them in season, as do a few stellar grocery stores (The Root Cellar, I am looking at you). Many people have quince trees growing in their yards around town and don’t want to deal with a fruit they can’t eat raw – ask around. My sources in the past have included these quince-tree-owning ‘friends’ and neighbours, a stint volunteer-picking with the Fruit Tree Project (where you get to take home some of the fruit you picked), and farm stores such as Dan’s Country Market on Oldfield Rd. 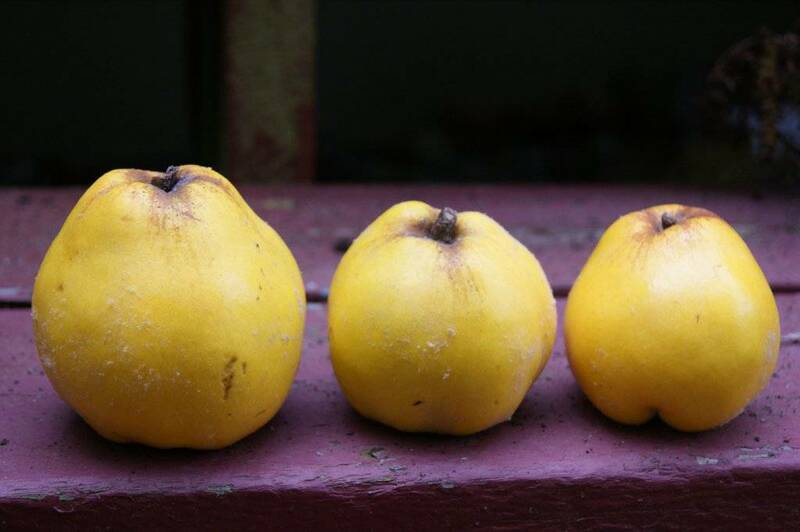 Once you know what quince are, you will notice them available for sale in the fall in many locations. So, despite being difficult and unusual, quince have enough fans out there to keep the commercial distribution alive. But for today, I am making quince paste. Simple, straight-forward, and with multiple uses. Yes, it takes most of a day, but most of that time is hands-off, while the rose-guava perfume of cooking quince fills your home with its magic. 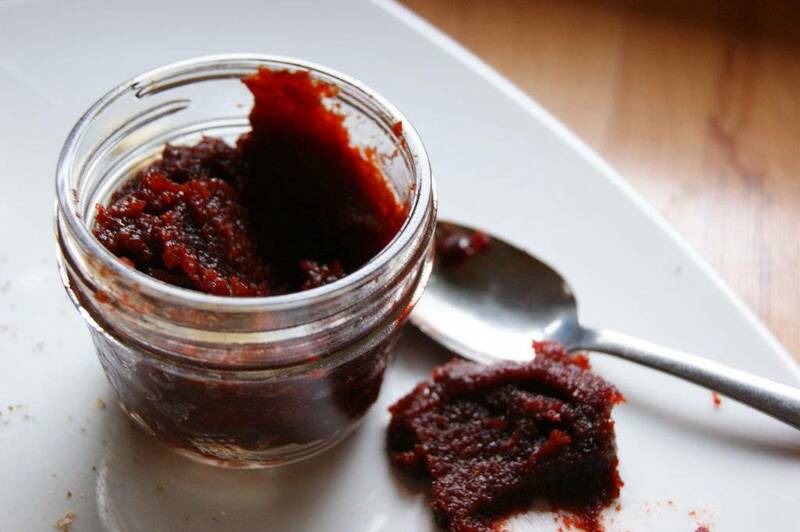 * The only other fruit I know of that does this is guava, and guava paste is known as membriyo in the Phillipines, a former Spanish colony that would have known about the Spanish quince membrillo (see above). Wheels within wheels, people. 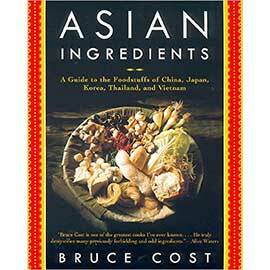 This is an adaptable recipe. Make it with however many quince you have. Start this recipe in the morning so you have enough time to complete it. OR make the recipe up to step 3, and then start the process again on day 2. I don’t add any spices to quince because their flavour is so multi-layered and delicious on their own. 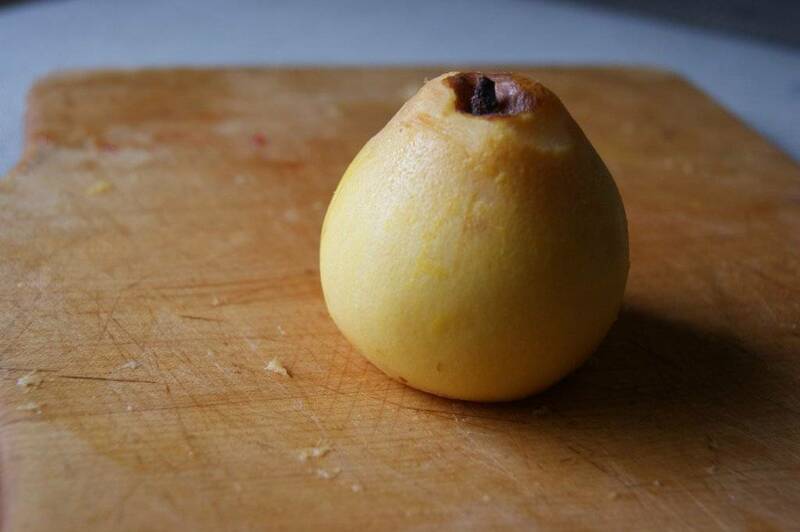 NOTE: Baking the whole quince for 30 minutes first makes them worlds easier to peel, chop, core. 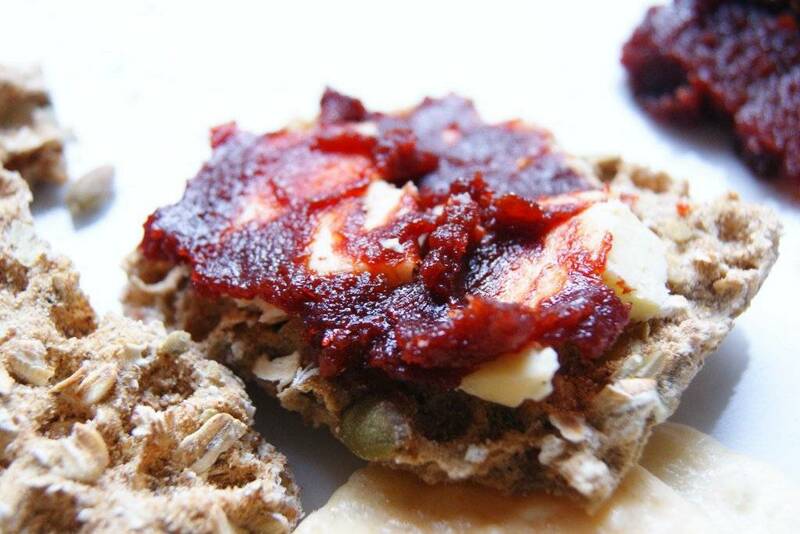 In short, bake the quince first turns Quince Paste from a nice recipe idea into something you may actually make! Preheat oven to 350 F. Wash the quince in running water to remove the fuzz. Arrange upright on a rimmed baking sheet. Place in the oven for 30 minutes, until the skins turn a brownish shade. Remove from the oven and let cool enough to handle. Use a sharp paring knife or a peeler to scrape off the skins (some of skins may rub off in your hands, but not all of them). 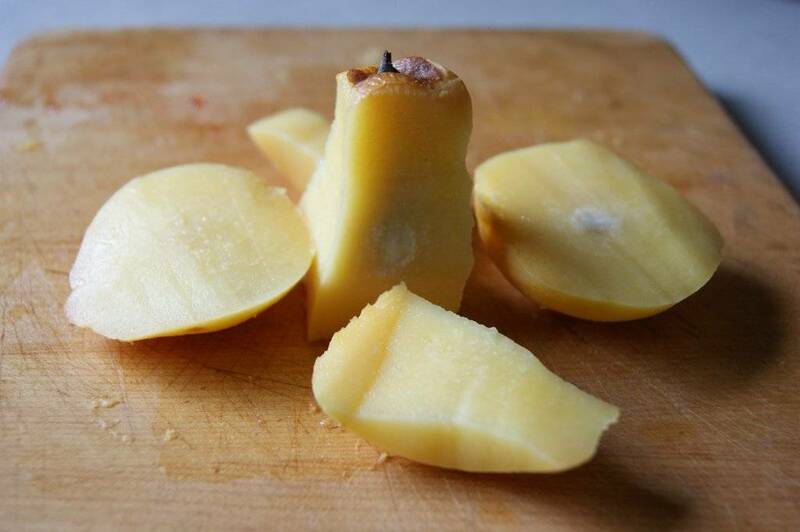 Alternatively, leave the peels on but be prepared to push your cooked quince through a sieve or food mill later. 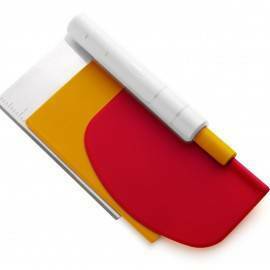 It depends what you’d rather do: peel now, or food mill later? When you are all done, add enough water to the quince pot so that you can just see the water through the top layer of quince. Place pot on the stove and bring to a boil. 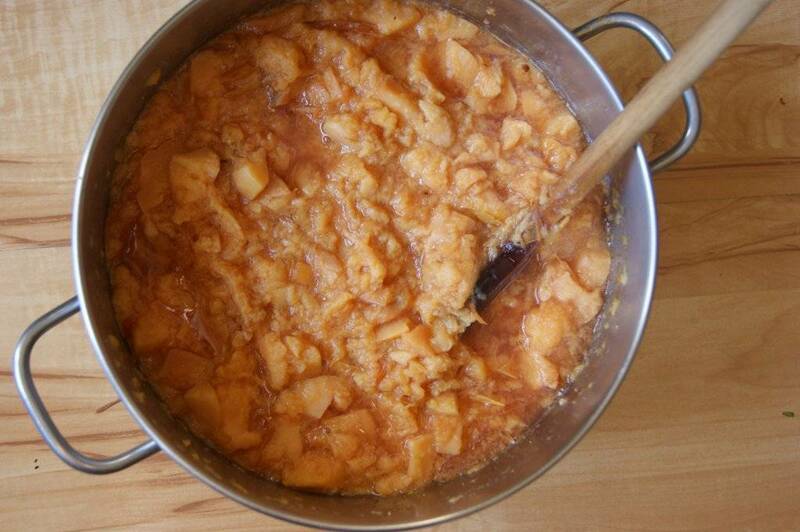 Reduce heat and simmer, covered, for 20 to 30 minutes, until quince is completely soft and mixture dissolves into the texture of applesauce when stirred vigorously with a wooden spoon. Or, you can blend mixture using an immersion blender or food processor, if desired. (If you have left any peels of bits of core on the quince, now is the time to run the mixture, in batches, through a food mill). 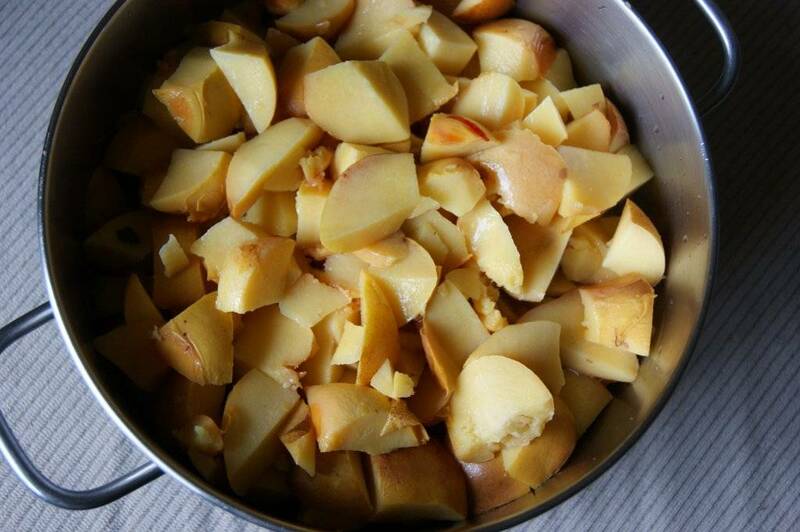 Quince mixture can be prepared up to this point and refrigerated for up to 3 days before proceeding with the next stage of the recipe. Measure how much quince ‘sauce’ you have. For every 3 cups of quince sauce, add 1 cup of sugar. Place the quince sauce and sugar in a pot with a heavy bottom (possibly this is the same pot you have already been using). 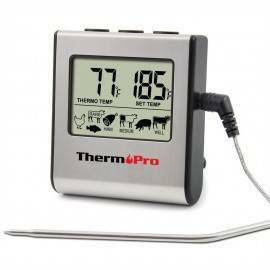 Mix well and return the pot to the heat. Turn on low and stir until all the sugar is dissolved. Taste the sauce at this point. It should be quince-flavoured with a nice balance of sweet and tart. If the sauce is too tart for your liking, add more sugar to taste. If you like more tartness, add some lemon juice. Preheat oven to 275 F. Continue cooking quince sauce on low heat until too thick. By too thick, I mean when the sauce is thick enough to have volcanic explosions of hot quince sauce come out of the pot as it bubbles. At this point (preferably, just before this point), transfer the quince sauce to a large glass or ceramic casserole dish (I always use my lasagne pan). Place in the oven and bake, stirring occasionally (paying especial attention to the edges and corners of the pan while stirring) for 4 to 6 hours, until the paste is burgundy-coloured and thick. Remove pan to cooling rack and immediately scoop the paste into hot, sterilized small canning jars. Twist the lids on and let cool. Keep once jar of quince in the fridge and pack the rest in the freezer. 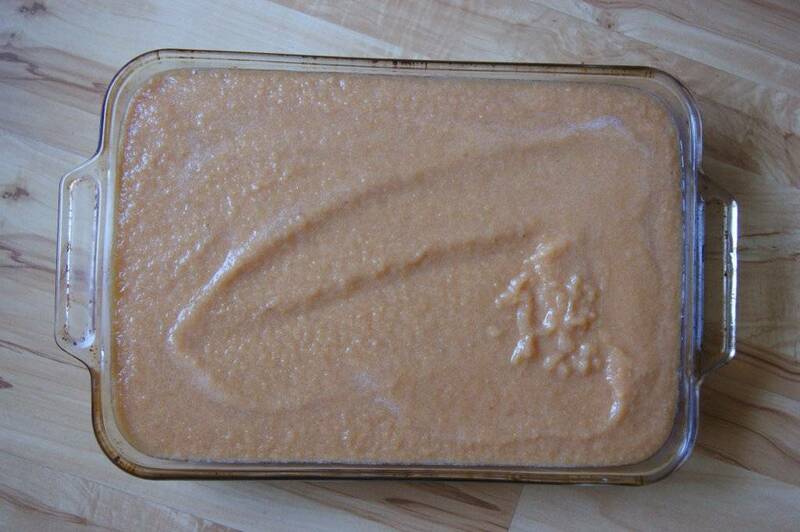 When I made this, I had 8 cups of quince sauce, which turned into about 3 or 4 cups of paste. If you like, you can pull the quince out of the oven before it has gotten to the paste stage – when it is more like a “butter” (as in apple butter). Place quince butter in canning jars and freeze OR process in a hot water bath. 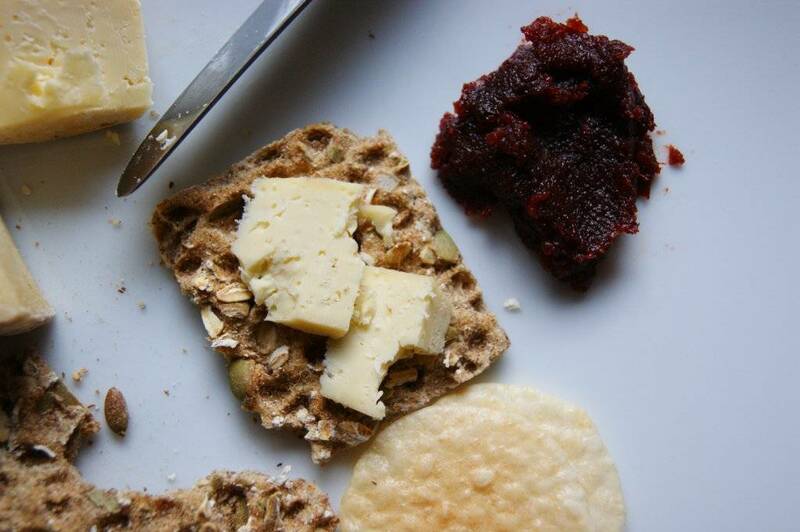 Serve quince paste with a platter or bread, cheese, and charcuterie. 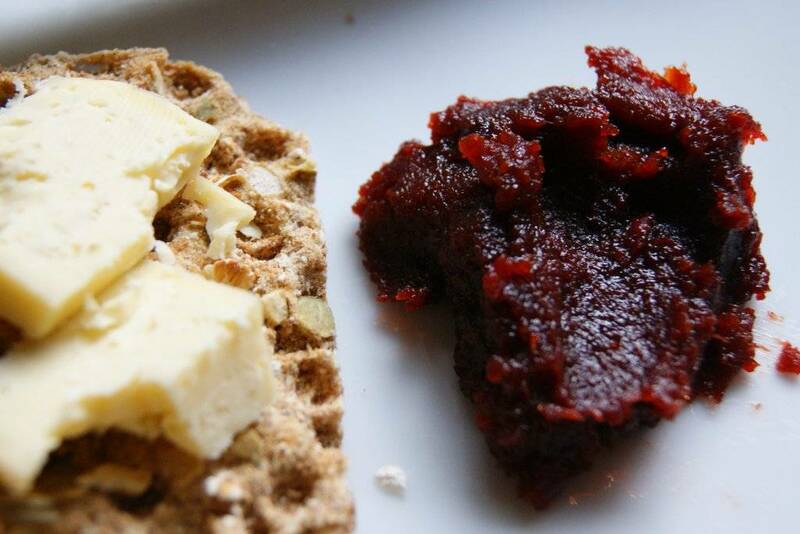 Or spread on toast or biscuits and just eat as is. Softer quince ‘butter’ can be stirred into yogurt and porridge, spread on crepes or pancakes, or mixed into salad dressing for spinach-blue cheese salad. Either can be stirred into fruit mixtures that are destined for a pie or crisp to add a layer of deliciousness unparalleled. 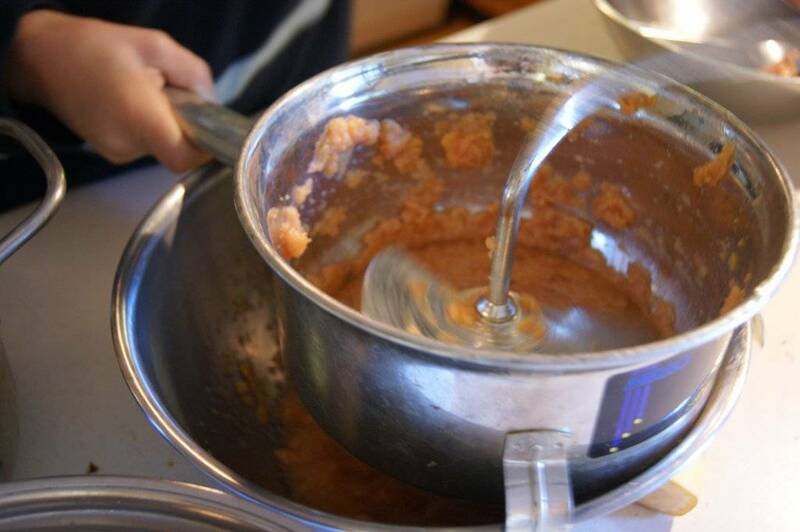 Heidi, what a great write-up and pix of membrillo-wrangling. Thanks! Your site’s always interesting. 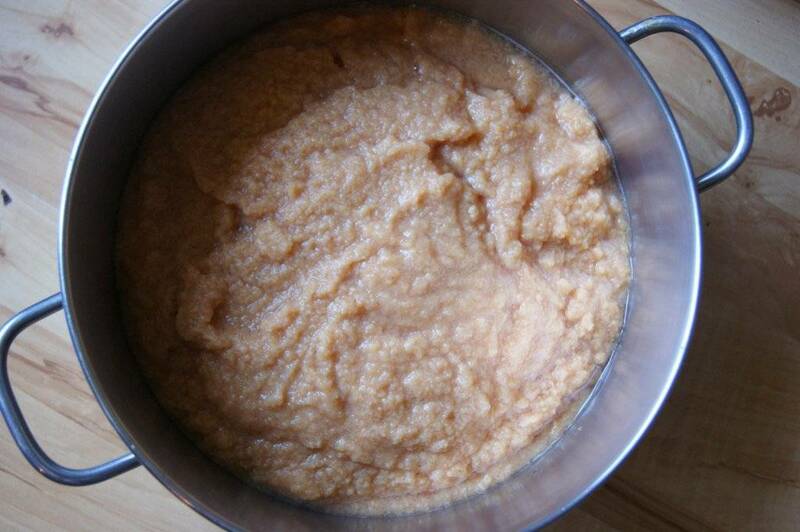 I’ve made membrillo for many years just because my family gets such pleasure from it. I first tasted it in Portugal, where it was called Romeau & Juliette. The bars served small slabs of membrillo layered with a slab of dry goat cheese underneath. It was gorgeous and I had no idea what it was but I LOVED the name. Met it again many years later in Italy as Marmalada. My husband’s fam know it from their childhood in Guadalajara, where it was served on toast for breakfast. It’s very cool stuff, and I play Spanish music while making it. We buy cheeses (from Chorizo & Co) in anticipation of our annual First Batch and every year we’ve introduced friends to its delights. Perhaps we need to have a Wine & Cheese & Membrillo tasting one night to celebrate the amazing transformative quality of this fruit (and the ancient lineage of cooks who figured out what to do with it)! Quince also make an easy and killer-good tart tatine. It’s a deeply, redly, glossy, perfumey wonderful dessert…I think you’ve inspired me to dig out the last stash of my quince and make the house fragrant. Thanks again! I can attest to the magnificence of membrillo! 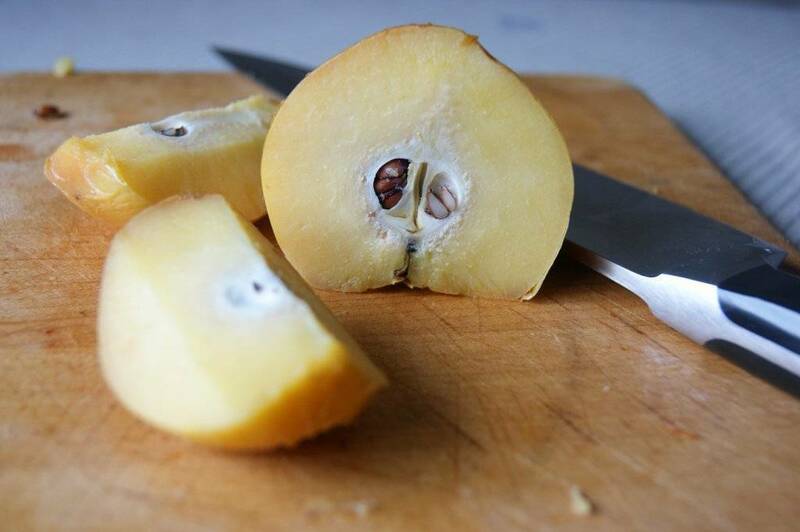 Definitely bake or freeze the quince first so that you can cut them up easily. I’m very generous with the amount of fruit I leave on the core. I’ve found that there are very hard sand like grains around the core that ruined the mouth feel of one of my earlier batches of membrillo. But fear not the cores did not got to waste. I’ve used them to make quince jelly and Paradise Jelly, which was one the most popular preserves I’ve ever made.